The 9th Leg of the Race continues as teams must now take a ferry from Vienna to Bratislava, Slovakia! All teams will be on the 8:30am ferry. 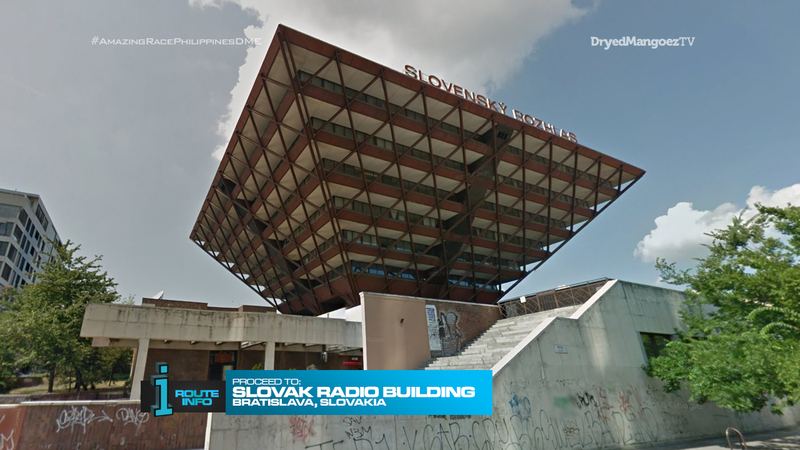 Once teams arrive in Bratislava, they must make their way to the Slovak Radio Building for their next clue. Teams must now put together a puzzle replica of this uniquely designed building. Teams will collect pieces at the building and transport them to the nearby Fountain of Union where they will assemble the puzzle. The fastest team to assemble the building replica will win a special prize… P100,000! This is also the Final! Trigger Point of the Race. If any team finishes the puzzle in two minutes or less, the final U-Turn or Yield will be activated on the next Leg. 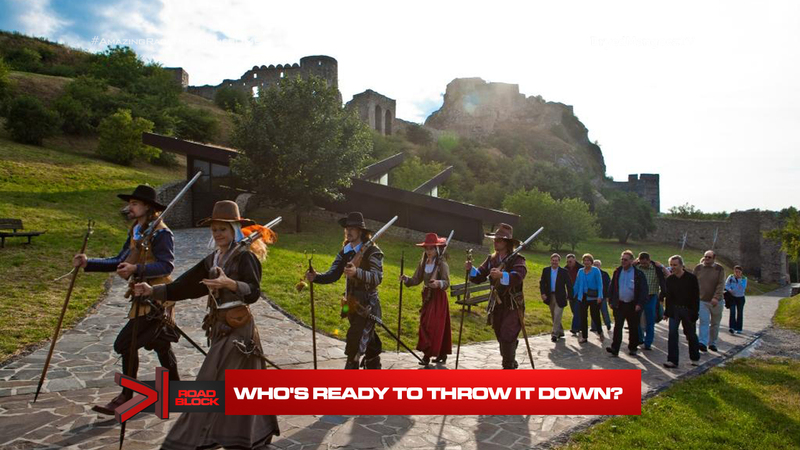 Teams must now make their way to Devin Castle where they will find the Road Block: Who’s ready to throw it down? For this Road Block, teams will get a lesson in technique of the javelin throw. When teams can hit three different targets at three different distances, they will receive the next clue. Also! For the team who arrived last at the SuperLeg midpoint, they will face a Rewind and must complete the Road Block twice. 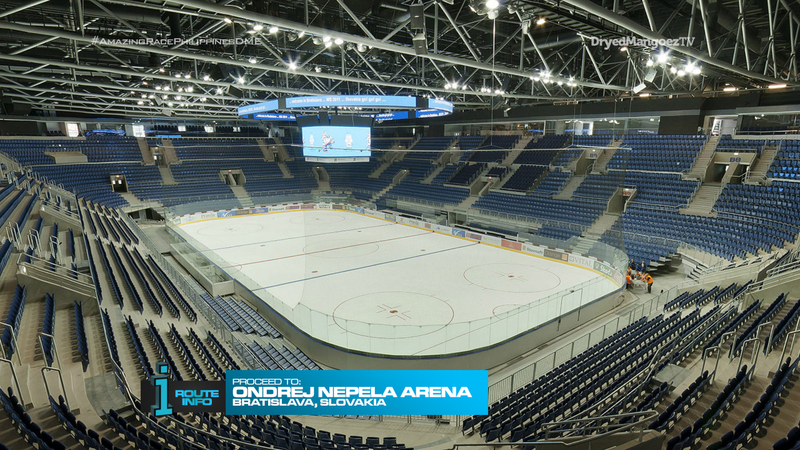 Teams must now head to the Ondrej Nepela Arena where they will encounter a Duel Duel! For this Duel Duel, teams will face off with hockey penalty goals. The first team to score five goals will win the Duel Duel. Each team member must be goalie and attempt to score at least two times each per five attempts. The last team must do hockey drills with the pros to get the next clue. After the Duel Duel, teams will encounter the Detour: History or Current. In History, teams will hop into a classic car. Using only photos of communist-era photos of Bratislava, teams must locate these four locations in the midst of modern Bratislava. Once they have collected a ticket from each of those locations, they will receive the next clue. 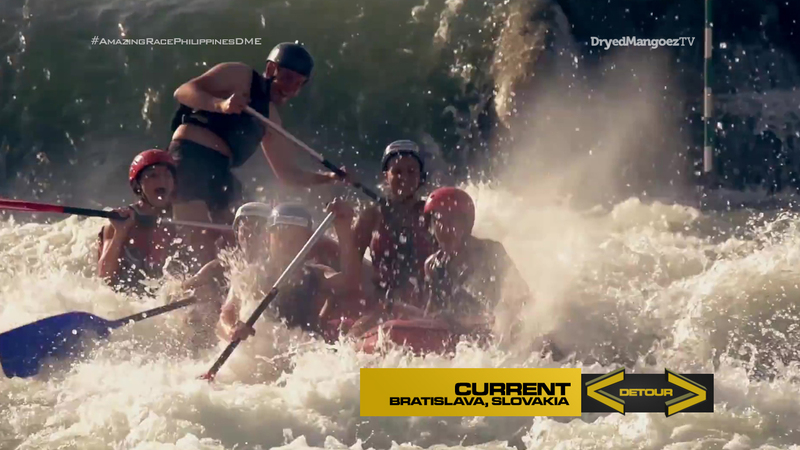 In Current, teams will head to the Cunovo Water Sports Centre and paddle a whitewater raft through a slalom course. Each team member will grab one flag hanging along the course and exchange them both for their next clue. 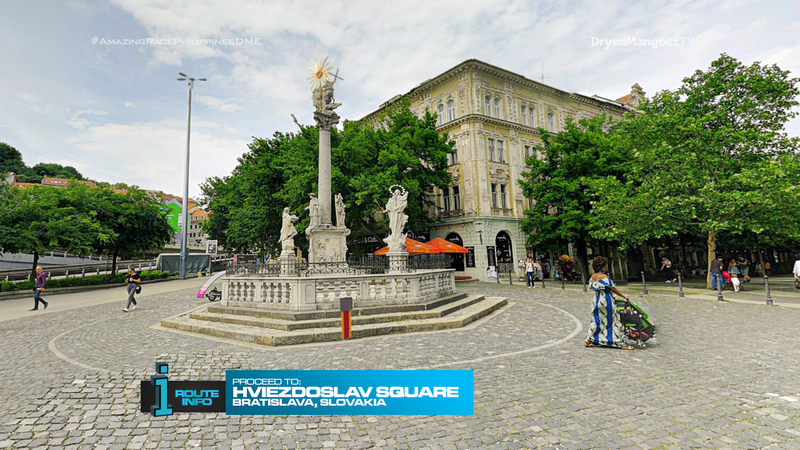 That clue directs teams to Hviezdoslav Square. 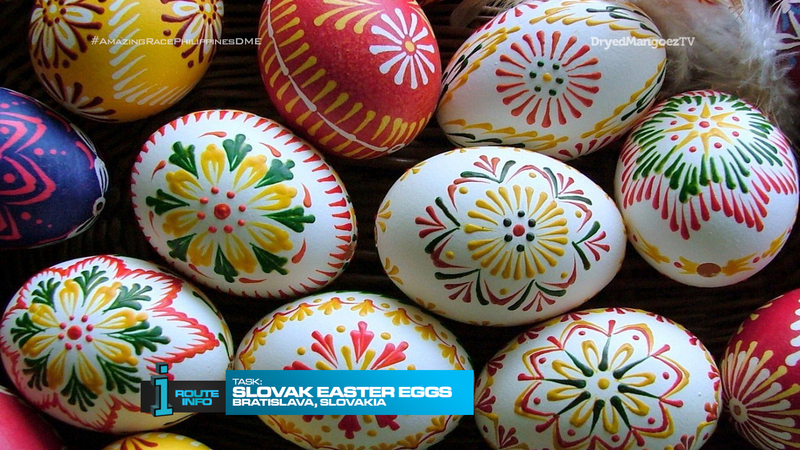 Here, teams will learn how to make Slovak Easter eggs using two traditional methods: batik and waxing. One team member will use batik, the most popular technique in Slovakia in which patterns are drawn by a pin dipped into warmed liquid wax. The other team member will use wax crayons to make their designs in relief. Once teams have correctly reproduced their chosen designs, they will receive their next clue. 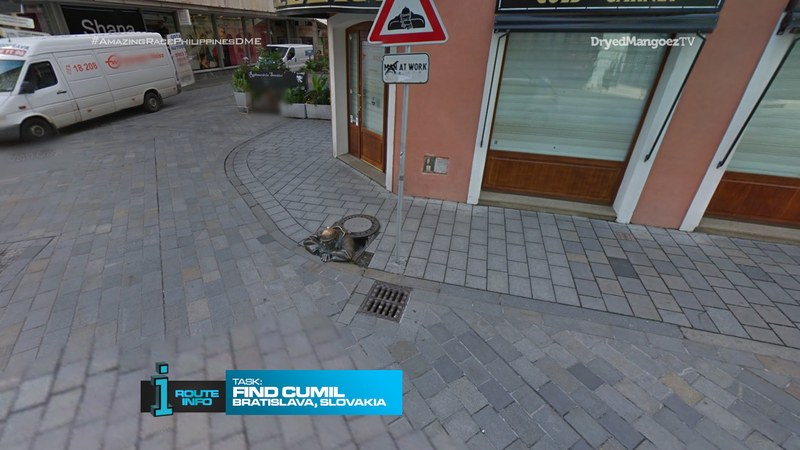 That clue tells teams make their way on foot to “Find Čumil”. 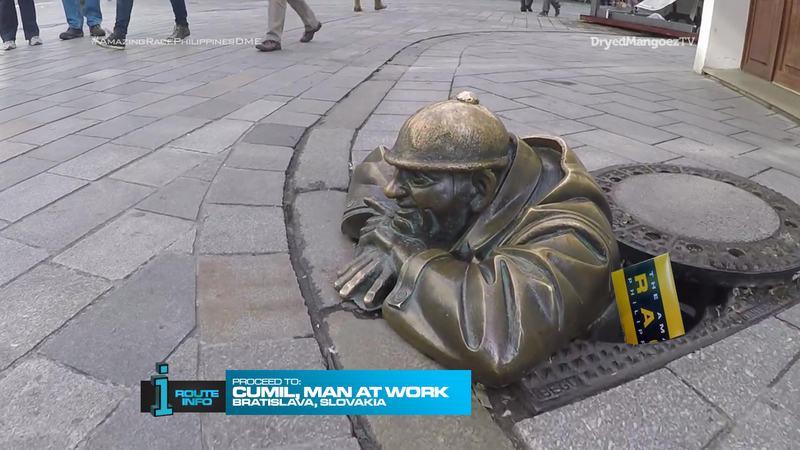 Teams must figure out that Cumil is the “Man at Work,” a famous statue in the middle of Bratislava. Cumil will have their next clue. 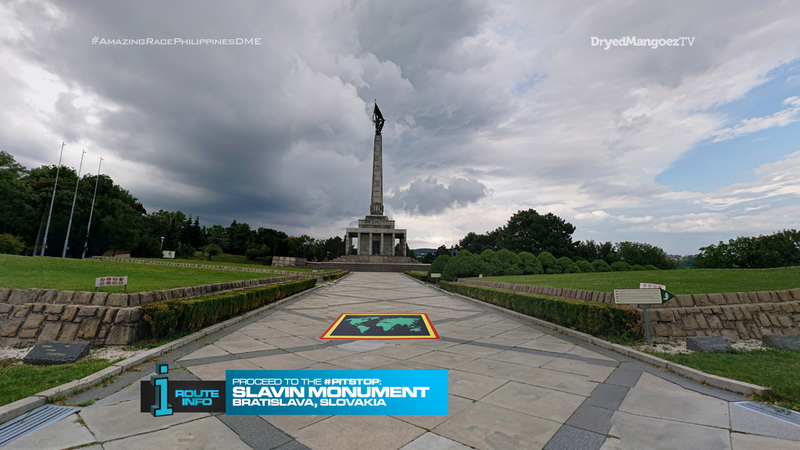 That clue directs teams to the Slavin Monument, the Pit Stop for this Leg of the Race. The last team to check in here WILL be eliminated. So this is the second half of the SuperLeg, but it really can be a wonderful Leg on its own. #NewCountryAlert as well! I think Slovakia even deserves two Legs. But we have this solid Leg right here for now. First up, taking the ferry should be a wonderful way to get from Vienna to Bratislava. It’s a different mode of transportation from the usual trains and planes and cars that we see on TAR. So why not take advantage of a ferry when available. First task in Bratislava is the puzzle. This is yet another task recycled from TAR China 4’s finale task of putting together a puzzle of the China pavilion. They are similar architectural design too. But I thought it would be a good task here. And I think any puzzle task really should have a benefit or prize for being the fastest. 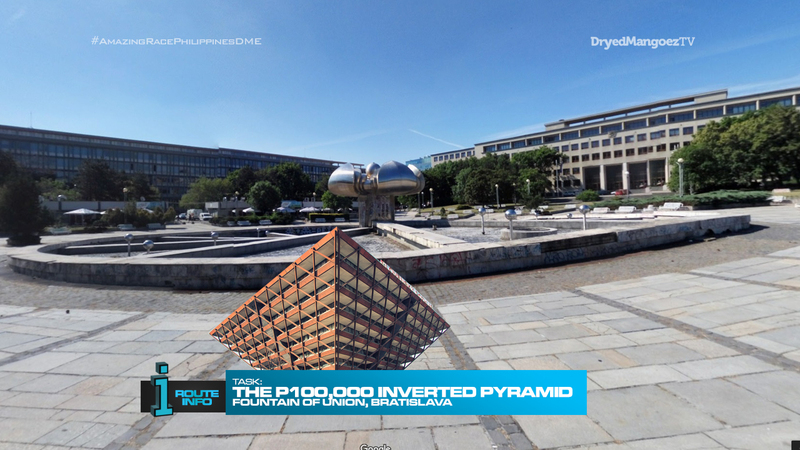 Since we have an extra P100,000 from the midpoint prize in Vienna, why not hand it out here? P50,000 would be a good enough prize as well. And it’s much better to be timed of course and the prize will be handed out at the Mat. 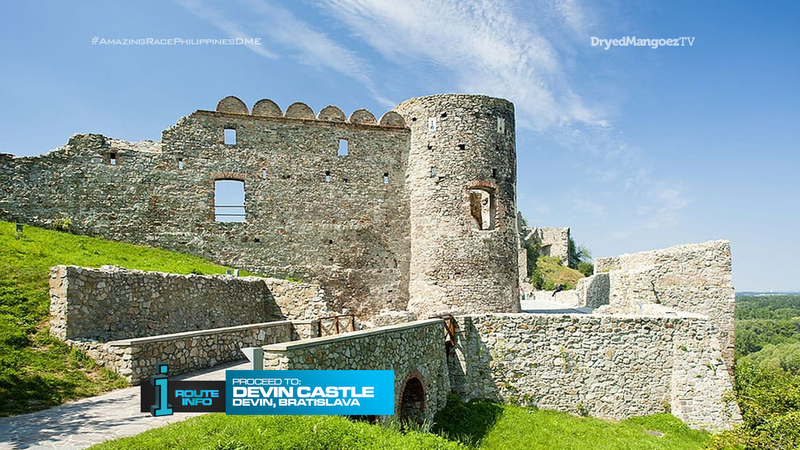 Next is the Road Block at Devin Castle. I read that they have a javelin activity here so, Why not? lol It’s a straightforward task. We toss in a hockey Duel Duel. As far as I remember, this will be the first time on TARPHDME that teams actually face off against each other. That is, teams will be the goalie against the other team instead of playing against local pros. This should make the task more exciting and fun. The Detour should be interesting. I read about this little communism tour in Bratislava. Should be a unique task to have teams in the classic car and searching for locations. This would also be a good opportunity to have a Samsung phone used for the task as well instead of taking tickets. We can also have the old cars break down to make it harder for the teams as well. Hehe. The other side of the Detour is definitely a recycled TAR task. TAR China definitely did it the worst, resulting in teams getting injured. But we will ensure teams are safe here. Finally, the Slovak Easter eggs were definitely on my reserves list as well. It can definitely be a great, tedious task for teams. There’s attention to detail of course. And being at the end of the long SuperLeg and right before the Pit Stop should really up the tension and frustration. After a nice little visit with Cumil, we go to the Pit Stop. Overall, a pretty great Leg in Bratislava! Yay for new locations!